HCM CITY – Thai investors are increasingly investing in Vietnam’s plastic industry, with many of them keen to fully acquire the government’s stakes in state-owned companies. SCG Group alone has invested in 20 companies. Last year it acquired 80 per cent stakes in Tin Thanh Packing Joint Stock Co, one of the country’s top manufacturers of flexible plastic packaging. It also has majority stakes in four other firms producing plastic household utensils and packaging, Viet-Thai Plastchem Joint Venture Company, TPC Vina – Plastic & Chemical Corp Ltd, Chemtech, and Minh Thai Plastic Material Co Ltd. 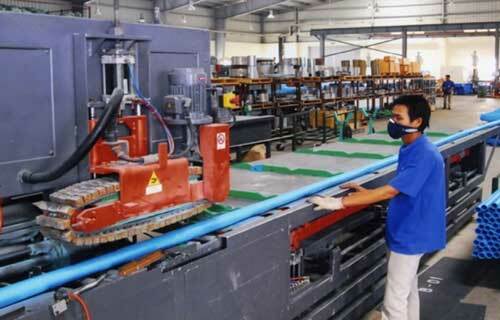 It has a 20 per cent stake in Binh Minh Plastic JSC and nearly 25 per cent stake in Tien Phong JSC, who together hold half the market share in the plastic building materials market. Tran Viet Anh, chairman and general manager of Nam Thai Son Co and deputy chairman of the HCM City Rubber – Plastic Manufacturers Association, said the country has nearly 3,000 plastics companies, 99.8 per cent of them private. Lacking the confidence to take on the new rivals, in many cases showing signs of declining production and business capacity, many domestic firms agree to sell out when foreign investors offer high prices for their stakes, he said. The plastics industry is one of the fastest growing in Vietnam, expanding annually at 16-18 per cent in 2010-15, Lam, who is also chairman of Rang Dong Plastic joint Stock Company, said. Anh said Thai firms only pay one per cent or even zero per cent interest on bank loans for certain projects, while Vietnamese firms have to pay 6-7 per cent, making it hard for them to compete with the Thais.